At this time of the year, there's lots of talk about food for lovers, which interests me because (have you guessed?) I'm a lover of food. In particular, I'm a lover of steak and butter. This is what I might cook for my dearly beloved on 14th February, if he plays his cards right. 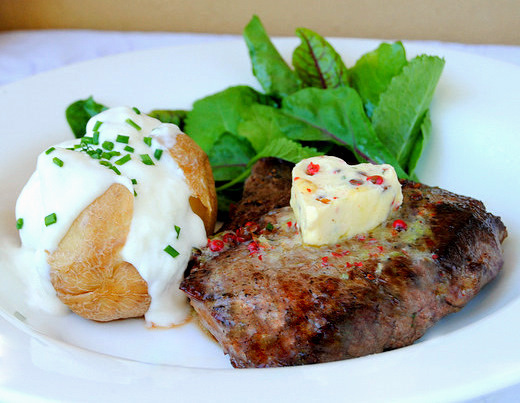 As the butter melts, the heat of the steak releases the pepper, lemon and rosemary aromas. This recipe is quick and easy, but you will need a small heart-shaped biscuit cutter. (Unless you're not a romantic, in which case you can shape the butter into discs.) These cutters are available from good kitchen shops. 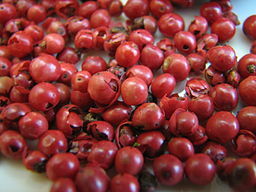 Pink peppercorns are less easy to find, but well worth tracking down. They have a sweetish taste quite distinct from black and green peppercorns, and are in fact not true peppercorns at all, being the fruit of Schinus terebinthifolius, a Brazilian flowering plant belonging to the cashew family, and also known as a Brazilian pepper tree, Christmas berry, or Florida holly. My husband bought a bottle of these for me from Germany after a business trip three or four years ago, and they're still as pungent as they were when I first opened the bottle. The papery seeds are a beautiful deep coral-pink and crush very easily under light pressure from the blade of a knife. I'm smitten by their lovely colour and aroma, and I think you will be too, but as pink peppercorns have been known to cause allergies and dermatitis in certain people, I advise you to eat one and wait for a few hours before inflicting them on your darling. Bring them to room temperature before you cook them. Season the steaks with salt and pepper immediately before you cook them. Heat the oil until it's ferociously hot and shimmering, but not yet smoking. Lay the steaks in the shimmering oil and allow to cook for a minute and a half to two (depending on the thickness of the steak) without moving or prodding them. Turn them over with a pair of tongs when they're beautifully browned, and the add a knob of butter to the pan (see recipe, below). Cook for another minute and a half, basting frequently with the butter. If you're not confident about cooking steak, turn one of them over and sneakily cut a deep slit in its thickest part. You will lose some juices from the steak by doing this, but the loss is minimal. If the middle of the steak is a lovely dark pink, and you're looking for medium-rare, remove the steak from the heat immediately (it will continue to cook as it rests). If it looks disturbingly bloody on the inside, give it a little longer. I love to serve steak with a baked potato brimming with sour cream and chives (or a mixture of sour cream and yoghurt, just to keep heart attacks from the door), but this would also be nice with a zingy potato salad, or little new potatoes, or a pile of warm, buttery mash. The salad leaves in the picture are mustard greens and red-vein sorrel leaves, both of which I grow in pots on my veranda. First make the butter. Put a handful of ice chips on a small plate, and place it in the freezer. Finely chop or snip the rosemary needles and gently crush the peppercorns using a mortar and pestle, or a rolling pin. Don't pound them too hard, or they'll turn to a paste. Stir the rosemary, crushed peppercorns and fresh lemon zest into the butter, and mix well. Season to taste with salt and black pepper. Take the plate with the ice out of the freezer and push the ice chips to one side. 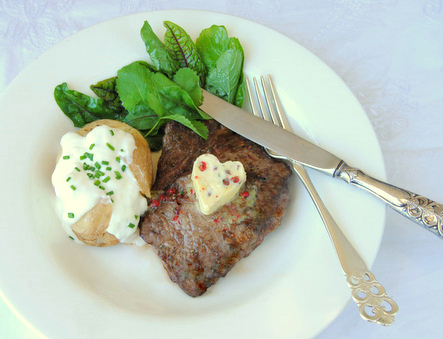 Place the heart-shaped cutter on the plate, and fill with the flavoured butter. Smooth the top and place back in the freezer for 10 minutes, or until firm. 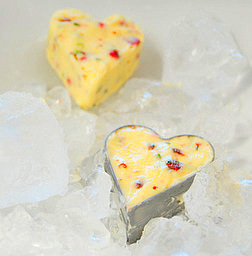 Push the heart-shaped butter pat out of the mould and set to one side of the plate. Repeat the process to make a second heart-shaped butter piece. Reserve the remaining butter. Heat the oil in a frying pan over a high heat. When the oil is very hot and shimmering, add the steaks and cook on one side until nicely browned and caramelised (see my notes, above). Flip the steaks over. Add any remaining flavoured butter to the pan, and, using a spoon, baste the steaks every twenty seconds. When the steaks are done to your liking, remove them from the pan and place on a plate to rest for 5 minutes. Slide the steaks onto plates and top each one with a pat of flavoured butter. Serve immediately with green salad and a baked potato. Hey early bird, first up with the Valentine's recipes. Looks so lekka, want to have to now already. Love the pink peppercorns! This is a work of art! The heart-shape is so pretty. Now that is adorable! I'll have to go scouting out some pink peppercorns. I love how they look on the steak after the butter melts. Great idea! Wow, I never knew that pink peppercorns are not really pepper. My hubby won't be getting anything this special for Valentines day - revenge for all the nose snubbing on Meatless Monday! Now I am starving! Looks delicious! Thank you all. I'm sorry to keep posting things about pepper, but I just can't help myself. And pink peppercorns are very lovey-dovey pink, aren't they? @Rose Tell him, when he buys you a new car, he'll get a present on Valentine's Day! I'm a happy steak fan as well, and I love your little butter hearts. Am I the only person in the world who loves Valentine's day?